New York City Immigration Song is a data representation in the form of a digitally controlled acoustic sound installation. 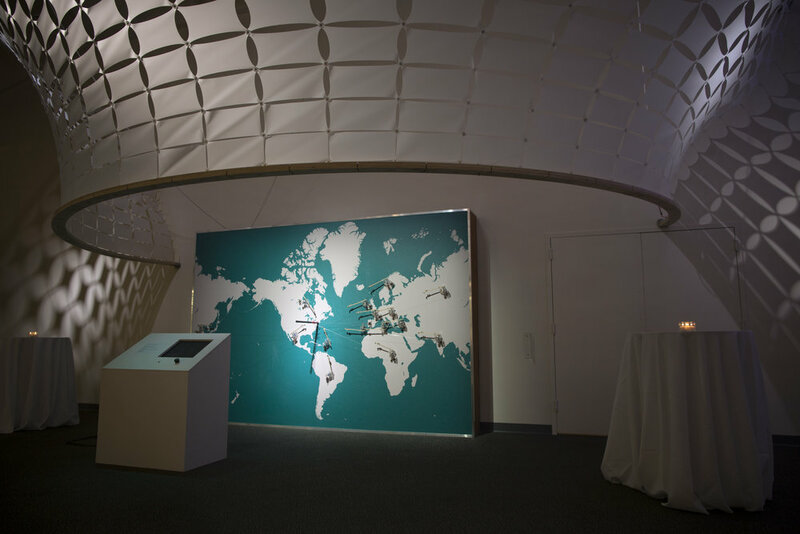 It features a network of mechanically actuated piano strings stretched from nodes across a wall-mounted map to a central anchor point located at New York. New York City immigration data dating back to 1855 serves as material for an algorithmic musical composition, sonically representing the city’s changing population and the countries to which it is connected through its residents. Distance from point of origin to NYC: Pitch of note. lower = longer distance (wires tuned to same tension). Number of people: Duration of note. Missing Data Point: Snare hit. Data Representation of NYC immigration data from 1855 - 2000. Data sources: U.S. Census data as compiled in the Encyclopedia of New York City 2nd Edition, Kenneth T. Jackson(editor).